The natural history of Lake Okeechobee, at 730 square miles the largest lake in Florida, is intimately entwined with that of the surrounding Everglades. Before the twentieth century, water from the north would drain into the lake, and when the water level rose high enough, it would “sheet-drain” into the southern Everglades. Early in the twentieth century, dikes were built around the lake to stop the southward drainage into the Everglades, and to allow that land to be used for agriculture. In 1928, a hurricane caused a catastrophic flood that overflowed the southern dike and killed at least 2,500 people. So the dikes were made bigger and higher to protect the south. In particular, for the production of sugar at government-subsidized rates. The determining principle was to make America independent of foreign sugar producers, even if that cost the American consumer. Okeechobee is a warm, shallow lake. After heavy rains, the water rises, and then the Army Corp of Engineers releases the excess into several outlets. These outflows run to the ocean on both the west and east coasts of the state, the Gulf of Mexico and the “Treasure Coast”, respectively. The water of Lake Okeechobee has become an incubator for “blue-green algae”. “Blue-greens” live in most lakes, often present at low, unobserved, levels. Under certain conditions they grow into blooms that can cover whole freshwater lakes with a slimy green film. 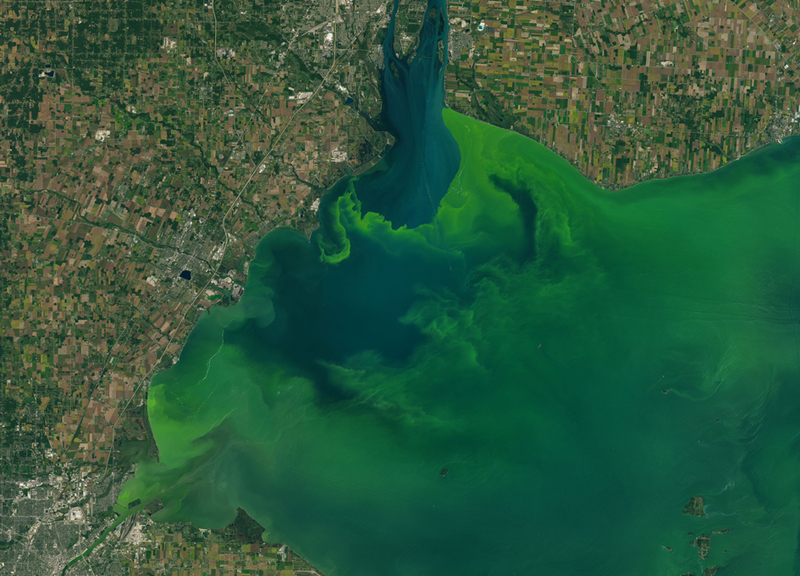 Massive algal blooms stifle the growth of other organisms. And when they die, usually when cooler weather sets in, they are degraded by bacteria, which generates noxious odours and toxins, and depletes oxygen in the water. Blue-green slime on the shores of Lake Winnipeg in 2016. Warm water and a source of phosphate favour the growth of blue-greens. Phosphate may be present in a lake naturally, but it can also be provided by farm operations and other man-made sources. In 2018, there was an historic bloom of blue-greens on Lake Okeechobee, which covered 90% of the surface. As a result of high water levels, this broth was released into its draining rivers by the Army Core of Engineers and made its way to the coasts. Some blue-greens produce toxins, including neurotoxins called microcystins. Microcystins can cause nausea, vomiting, and even acute liver failure if they are ingested (few people go near enough to water heavily infested with blue-greens to be affected, but dogs and cattle have died). In the case of the 2018 bloom, people living along the St. Lucie River, which drains into the (east) Treasure Coast of Florida, complained about the ugliness, the loss of access, and the smell — like moldy bread, according to one resident. At least 86 people went to hospitals with skin rashes and other ailments between July 24 and August 6. In addition to the effects of the blue-greens in the St. Lucie River, the outflow to the coast led to a sharp reduction in tourism, a major industry. The infestation of Lake Okeechobee is similar to what is happening to an increasing number of lakes around the world. The illustration at the top of this post shows Lake Erie, which has been severely affected in recent years. The same factors always come into play; warming temperatures and increasing nutrients, particularly phosphates. At the same time as the blue-greens were blooming on Lake Okeechobee, Florida was seriously affected by a “red tide”. Red tide is a different thing entirely. Blue-greens and red tide are both described as algal blooms, but the red version is due to a different organism from the blue-greens. It also produces neurotoxins, which accumulate in fish and shellfish. When red tides move into coastal waters, they are exacerbated by nutrients produced by human activity, and by warmer temperatures. The red tide of 2018 in Florida has killed fish in large numbers, as well as 300 sea turtles. Humans eating shellfish containing the concentrated toxins can become nauseated, and suffer neurological problems. In the summer of 2018, the fishery, and tourism, of Florida’s Gulf coast were moribund. By November, the red tide had lasted for over a year and was still going strong. Although different organisms produce blue-greens and red tides, both are made worse by human activity. In particular, as climate change leads to higher air and water temperatures, blue-green blooms become an ever-increasing environmental challenge. One warm August evening back in 1991, I was parked in my favourite chair, eyes unfocused, and a cool brew to hand. On the stereo, Coltrane was working through the changes of Giant Steps. A few minutes after 7 o’clock there was a soft but insistent knocking at my door. Reluctantly, I got up to answer it. It was my next-door neighbour, a stay-at-home mom whose reasons for staying at home were now in junior high. She had become a sales rep for a company producing and selling blue-green algae as a food supplement. Their supply came from Klamath Lake in southern Oregon which they emphasized was entirely safe, without toxins, and incomparably better than blue-green algae harvested elsewhere. She offered me a free sample of cat food made from Klamath Lake algae, and, if we liked it (more accurately, if our cat, Rosie, liked it), she’d be happy to sell us some. The taste, apparently, was good enough that Rosie wolfed it down. But two hours later she threw it back up. Cats do that a lot and we didn’t consider it an indication that she’d been poisoned. Just that for some reason her tummy was not happy with the algal-based cat food. Or maybe something else she’d eaten that day (Rosie was a mouser who cleaned up after herself). But that ended our dietary experience with Klamath Lake blue-greens. Klamath Lake is in the Second Congressional district of Oregon, which is one of the largest in area in the lower 49 states. It has elected a Republican Congressman in every election since 1981. In the 2018 mid-term, he was the only Oregon Republican elected along with 4 Congressmen, 2 US Senators, and a Governor, all of whom are Democrats. A large blue-green lake in a district firmly politically red in an otherwise blue state. The type of blue-greens grown and harvested in Klamath Lake is “Spirulina”, which is safe to eat. Although stores in my own health food-rich environment have seen reduced sales of blue-green algae in recent years, it’s still an important item for new-age diets. Its proponents advertise blue-green algae, particularly Spirulina, as a “perfect food” (now, “superfood”). They claim that it contains the highest concentrations of proteins and lipids of any food, and is a good source of B vitamins and iron. The further claims for Spirulina’s health-promoting powers found online include helping with weight loss, attention deficit-hyperactivity disorder (ADHD), hay fever, diabetes, stress, fatigue, anxiety, depression, and premenstrual syndrome. People also use blue-greens to boost the immune system, improve memory and energy, lower cholesterol, prevent heart disease, heal wounds, improve gut health, and even to treat precancerous growths of the mouth. Individual peer-reviewed studies support some claims of Spirulina’s effects on human physiology. For example, it appears to reduce the diastolic blood pressure in diabetics, although it has no effect on systolic pressure (1). Diastolic is the lower number in a blood pressure reading, and is considered to be relatively unimportant, compared to the systolic (upper) number. So the effect of Spriulina is of doubtful benefit. An earlier study found that a diet containing Spirulina led to improved clinical measures in Type 2 diabetes, which could be a useful effect, if it’s corroborated (2). But it has no effect on the level of hemoglobin A(1c), which is a record of the diabetic’s exposure to hyperglycemia, and indicates how well controlled their condition is. So again, the benefit of Spirulina is not self-evident. Studies on the effects of nutrition on humman health are notoriously difficult. The best estimate of such effects is determined by looking at “meta-analyses”, which combine the outcomes of individual research reports to derive the most reliable conclusions. Here, the news about Spirulina on an important set of symptoms called “metabolic syndrome” is not encouraging. Metabolic syndrome refers to a cluster of conditions, including increased blood pressure, a worse blood lipid profile, and insulin resistance, that predispose to heart disease and diabetes, among other conditions. Among a long list of so-called “superfoods”, including blueberries, cranberries, goji berries, chili peppers, garlic, ginger, chia seed, flaxseed, quinoa, cocoa maca, wheatgrass, and Spirulina, there was “only limited evidence. . . ” for effects on the parameters of metabolic syndrome (3). So the scientific jury is not giving a thumbs up on the health benefits of Spirulina, at least not yet. About thirty years ago, it was discovered that blue-green algae exhibit one of the most intriguing of biological behaviors: they undergo circadian rhythm (CR). Circadian rhythm synchronizes living organisms with the solar clock. It influences our bodies and our lives, making us wakeful (generally) in the morning, sleepy at night, and more-or-less susceptible to outside influences throughout the day. The award of the 2017 Nobel Prize for Physiology or Medicine to scientists studying CR underscores its significance. (I have posted two essays on circadian rhythm earlier, one about CR in plants, the other in humans). Our understanding of how CR works is far from complete, but we know that it involves a dynamic interaction within networks of molecules to produce “clocks” in living cells. One of the remarkable features of CR is that it has appeared three times during evolution, and the three products are different. In animals like humans, fruit flies, and mice, the molecular components are similar, and have largely been identified (that’s what the Nobel Prize was for). The design of plant CR systems is somewhat similar to those in animals, but the molecular components are different. 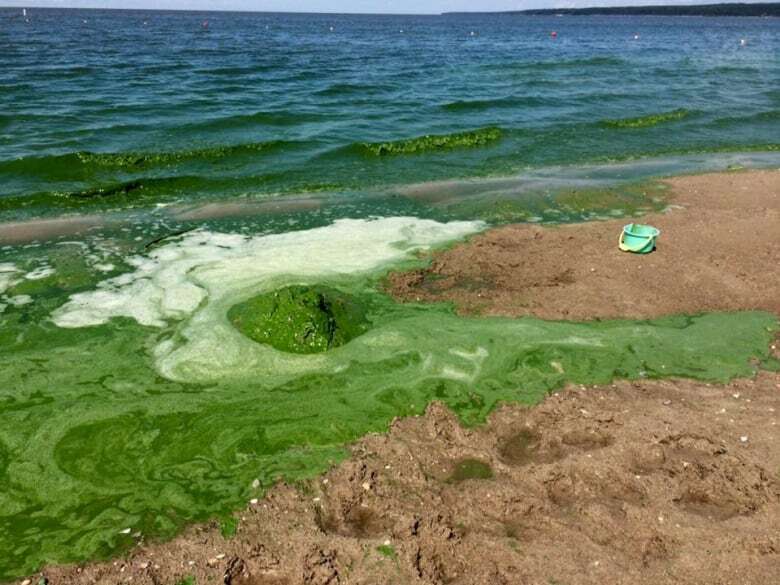 There’s a third solution, which is found in the blue-green algae, which have a mechanism different from the ones in animals and plants. A circadian rhythm, or any other kind of periodic behavior, requires a molecular clock. And clocks depend on oscillators, things that go back and forth, or up and down with a regular beat. For example, the pendulum of a grandfather clock. Electronic devices contain oscillators made of interacting electronic components such as capacitors, resistors, and transistors. Their oscillations generate electrical signals changing directions or magnitude in a precisely timed way. Biological oscillators that control CR produce changes in the levels, or forms, of specific molecules. In blue-green algae, for example, the concentrations of a number of proteins in the cell increase, and then decrease, and the cycle takes about 24 hours (circadian rhythms are just that: circa diem, about a day, with resetting by the daily 24 hour cycle of the sun). A highly simplified description of how a biological oscillator works is at the bottom of this post. It is nerdish, and not required to follow the larger story about CR in blue-greens, which is about to get interesting. It’s time to point out that blue-greens are not actually algae, despite the name. They are photosynthetic bacteria called cyanobacteria. For years they were incorrectly identified as algae because they look similar and grow in similar conditions. They are prokaryotes (no nucleus); true algae are eukaryotes. The colour of blue-greens/cyanobacteria is due to their photosynthetic pigments. These are activated by captured sunlight and use that energy to convert carbon dioxide to carbohydrates and other biological molecules. Their photosynthesis produces oxygen from water. Some species of cyanobacteria also convert atmospheric nitrogen to organic forms such as the amino acids, the building blocks of protein. These are good and useful activities. Just how critically important they are for the history of life on earth will be described in a following section. 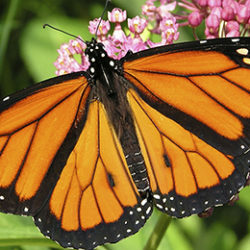 CR in animals and plants involves both proteins and genetic readout. Feedback inhibitors and activators resulting from the output of certain genes act on those and other genetic components in a complex, still poorly understood, network. What is unusual about CR in cyanobacteria is that it is requires only three proteins. It is by far simpler than CR systems in higher organisms. The puzzle of how CR works in cyanobacteria has been brilliantly illuminated, primarily by a group of researchers in Japan. Using the power of genetics, they identified three genes which, alone, are required for CR. They then isolated the protein products of these genes. When these proteins were incubated, at the right ratios, in the presence of the universal energy donor molecule ATP, they began to oscillate in structure (including modification with phosphate groups from ATP, association between proteins) with a 24-hour period (4). When the same components were isolated from cyanobacteria with a mutation that produced a longer or shorter time period in CR, the reconstructed in vitro system showed the same properties. For anyone interested in how living cells work, having the biology, biochemistry, and genetics in concordance is winning the trifecta. Circadian rhythm is crucial for cyanobacteria that carry out both photosynthesis and nitrogen fixation. Photosynthesis, and the production of oxygen, happens only during the day of course. The conversion of nitrogen from the air into organic molecules uses energy stored during photosynthesis. But it must happen only at night, because the nitrogen-fixing catalysts are poisoned by oxygen. The timing of photosynthesis and nitrogen fixation is controlled by their circadian rhythm, which insures that only one process or the other is active. A very long time ago, cyanobacteria made two essential contributions to life on earth. Without them, there would be no plant life or oxygen-breathing organisms. We don’t know how life on earth began, about four billion years ago. (Some serious scientists have proposed that life may have originated on another planet, and come to earth on board a meteorite. This is the “panspermia” model.) Most scientists think that a bag of catalytic molecules with reproductive and energy-generating capacity appeared in the primordial chemical soup on earth around that time. What we do know is that the small molecules arising as the products of the big bang cooled, including water, carbon dioxide, carbon monoxide, hydrogen cyanide, hydrogen sulfide, nitrogen and ammonia, can be converted to a wide array of biologically important molecules by ionizing radiation, heat, and electrical discharge. Such conversions can be generated in the laboratory, and the products include even large and complex biomolecules. A precursor of the cyanobacteria came into being around 3 billion years ago. 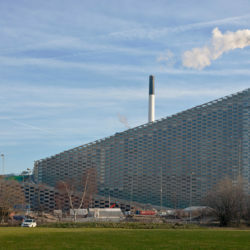 It had the advantage of being photosynthetic; its chromophores captured the energy of sunlight that sustained it. This photosynthesis produced oxygen. (There is also photosynthesis that does not produce oxygen. Cyanobacteria oxidize water, producing oxygen). These two features, photosynthesis and oxygen production, were the critical contributions of early cyanobacteria. It took several hundred million years to saturate the existing oxygen sinks such as iron (which rusts in the presence of oxygen). Then, about 2.5 billion years ago, the Great Oxygenation Event: a virtual explosion in atmospheric oxygen levels. Oxygen levels rose rapidly (if tens of millions of years can be thought of as rapid), and oxygen-breathing life was now possible. Not only possible, but probably rapidly dominant over obligate anaerobic organisms. The capability for photosynthesis spread from the primitive cyanobacteria into the world of plants. One or more plant cells probably engulfed, without destroying, an early cyanobacterial cell. That cyanobacterium became the precursor of the chloroplast, the organelle in modern plants that carries out photosynthesis. Evidence for this pathway includes that cyanobacteria and modern plant chloroplasts contain the same chlorophyll molecules, and protein-synthesizing molecular machinery (which is different from the plant’s other system for protein synthesis), and are structurally similar. Electron micrographs of a cyanobacterium (left) and a chloroplast of a plant cell (right), showing similarities in the membranous structures called thylakoids, which contain the light-harvesting structures. The cyanobacterium is about 4-5 microns in length, and the chloroplast image shows a 1-micron bar. Cyanobacterium micrograph courtesy of Dr. Michelle Liberton, Washington University, St. Louis. Plant chloroplast micrograph is from Howard Berg of the Donald Danforth Plant Science Center, Creve Coeur, MO. As for the cyanobacteria themselves, they never looked back. Because of their growth advantages (the ability to capture energy from sunlight and to fix nitrogen), they thrived, and continue to thrive. Today, they proliferate wildly under the right circumstances. Those conditions include living in quiet or very slowly moving warmish water, and plenty of sunshine. A few micronutrient are also necessary, particularly phosphate. Because of their metabolic advantages, cyanobacteria are able to manufacture carbohydrates, fats, and proteins using only carbon dioxide and nitrogen from the air. Blue-greens, or cyanobacteria, have been on earth for more than 3 billion years, and they probably won’t be going away any time soon. They will enjoy global warming, and many of the earth’s bodies of water now contain enough micronutrients, particularly phosphate, to sustain intense blooms. The phosphates that run into rivers and lakes from farming, detergent use, and in sewage, as well as natural deposits, generally stay in those bodies of water. Cyanobacteria use the phosphate to grow, and when they die, the phosphate goes back into the water, ready for the next bloom. It’s hard to imagine a more successful life cycle. You may have heard the semi-serious prediction that when all other life forms on earth are destroyed by apocalyptic events, the cockroaches will still be here. They’ll probably be eating blue-green algae. 1. Lee, E. H., J. E. Park, Y. J. Choi, K. B. Huh, and W. Y. Kim. A randomized study to establish the effects of Spirulina in type 2 diabetes mellitus patients. Nutr. Res. Pract. 2(4):295-300 (2008). 2. Parikh, P., U. Mani, and U. Iyer. Role of Spirulina in the Control of Glycemia and Lipidemia in Type 2 Diabetes Mellitus. J. Med. 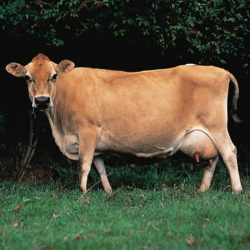 Food 4(4):193-199 (2001). 3. van den Driessche, J. J., J. Plat, and R. P. Mensink. Effects of superfoods on risk factors of metabolic syndrome: a systematic review of human intervention trials. Food Funct. 9(4):1944-1966 (2018). 4. Nakajima, M., K. Imai, H. Ito, T. Nishiwaki, Y. Murayama, H. Iwasai, T. Oyama, and T. Kondo. Reconstitution of circadian oscillation of cyanobacterial KaiC phosphorylation in Vitro. Science 308(5720):414-415 (2005). Two reactions are taking place: A is converted to B, and X to Y. The conversions may be enzymatic, or it may involve transcription of the DNA of a gene into RNA, or other events; the principle is the same. 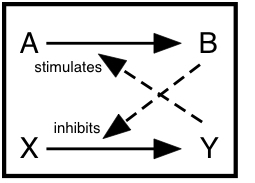 An oscillator can be created from this set of reactions if the product B inhibits the conversion of X to Y, and Y stimulates the formation of B from A. B is a feedback inhibitor, Y a feedback enhancer. Real oscillators are more complex than this, and other properties are important. For example, since enzymes catalyze these reactions, there is a hysteresis effect – events take time. Like all biomolecules, B and Y have a finite lifetime; they are constantly degraded, with a characteristic half-life. Now envisage the following. 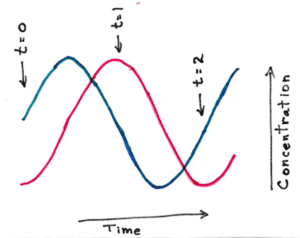 Start with B at a low concentration and Y at a high concentration (time=0 in the graph below). Because Y stimulates the process A­­—>B, B will start to be formed at an increasing rate, until it reaches a high concentration (time 1 in the graph). But as B increases in concentration, it gradually inhibits the formation of Y from X, and because all molecules have a finite half-life, the level of Y begins to decline, until it reaches a low value. Now the rate of formation of B decreases, since Y is at a low level, and we reach the starting condition (t=2). In other words, the concentrations of B and Y oscillate. In biological systems, these oscillations are linked to other processes, which then in turn become oscillatory. Needless to say, real systems are much more complex than this. For one thing, the system oscillates only if the various parameters are well matched – the rates of the various biological processes have to be compatible. Otherwise, a steady state results. Concentrations of B (red) and Y (blue) molecules over time in an oscillating model. In this model, the kinetic parameters of the system are actually determined by the decay rates of the molecules (B and Y). This can be proven quite easily, but that will be left as an exercise for the really interested reader. Previous Article How Many Calories in Bacon?